Michael and Florence have once again focused our attention on hurricanes, their origins, their forecasts, and their awesome power. 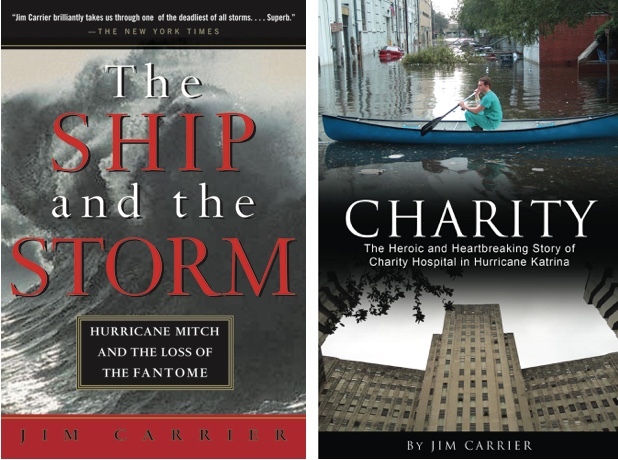 Two of the most recent destructive storms – Mitch and Katrina – are detailed in books by Jim Carrier. They are available for instant downloading and reading on most e-Book platforms. Charity is also available in paperback. See links below. The Ship and The Storm, described as “unequivocally THE BEST storm narrative” (Wendy Mitman Clarke), and “Utterly compulsive and unputdownable – the most exciting, authentic and humanly moving of all the recent storm books.” (Jonathon Raban), details the birth and deaths of Hurricane Mitch in 1998. Masterfully moving between the crew on deck of a doomed cruise ship and the forecasters of the National Hurricane Center, the book follows the path of the most destructive hurricane in the Western Hemisphere. It can be purchased as an eBook on Amazon, Barnes & Noble, iBooks/iTunes, Google Books and Kobo. Charity – the Heroic and Heartbreaking Story of Charity Hospital in Hurricane Katrina, is a remarkably concise drama of tragedy and heroism. “In a dying city and dying hospital…as if struck by angels, people walked out of Charity changed.” The author and his wife lost their home in Katrina, but returned to New Orleans — she to teach, and he to interview doctors, nurses, patients and staff. The story can be purchased as a paperback book or eBook on Amazon, Barnes & Noble, and Google Books. This entry was posted in Uncategorized on October 29, 2018 by jimcarrier. 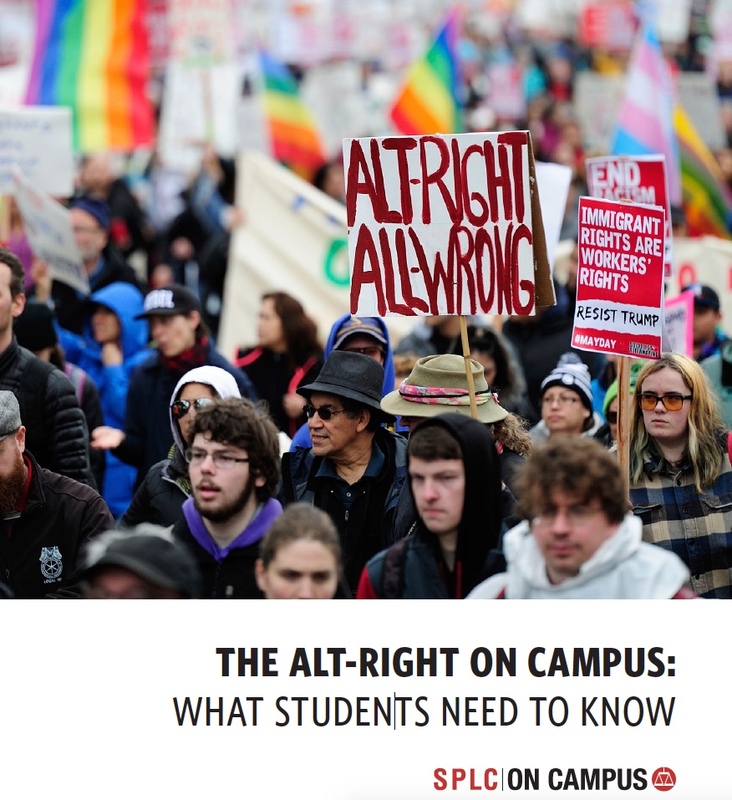 With college students returning to class in the coming weeks, the SPLC released a new guide today that advises them on how to respond when speakers associated with the growing white nationalist, or “alt-right,” movement, appear on campus. In recent months, numerous campuses have been rocked by student protests sparked by the scheduled appearances of alt-right figures such as Richard Spencer and Milo Yiannopoulos. The alt-right activity is part of a larger surge in campus organizing and recruitment by white nationalists. Now, the movement is seeking to capitalize on the publicity and momentum it gained amid its strong support of the Trump campaign. The guide is a project of the SPLC on Campus program, which currently has chapters at 30 colleges across the country. I wrote the guide for SPLC. In addition to offering step-by-step instructions for students to counter the movement’s influence, the guide explains the racist ideology of the alt-right and profiles its leaders. As the guide explains, public universities that have a policy allowing student groups to host outside speakers cannot legally bar alt-right speakers except under the most extreme circumstances. The SPLC urges students to hold alternative events that celebrate diversity, inclusion and cultural awareness. In addition, they should speak out against hate and encourage university administrators to issue statements condemning the views of alt-right speakers. This entry was posted in Uncategorized on August 18, 2017 by jimcarrier. 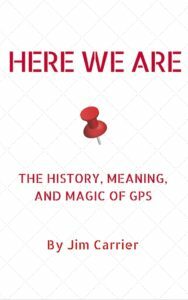 From award-winning science writer Jim Carrier comes the remarkable story of GPS – an invention so woven into the fabric of modern life we can’t imagine civilization without it. A troubled child of the Cold War, satellite navigation was created to aim nuclear missiles. Today, it is also used to find grandma’s house, guide drones, track packages, plant crops, spy on each other, and keep time. We take it granted, like we do electricity, unaware of how it almost didn’t happen. 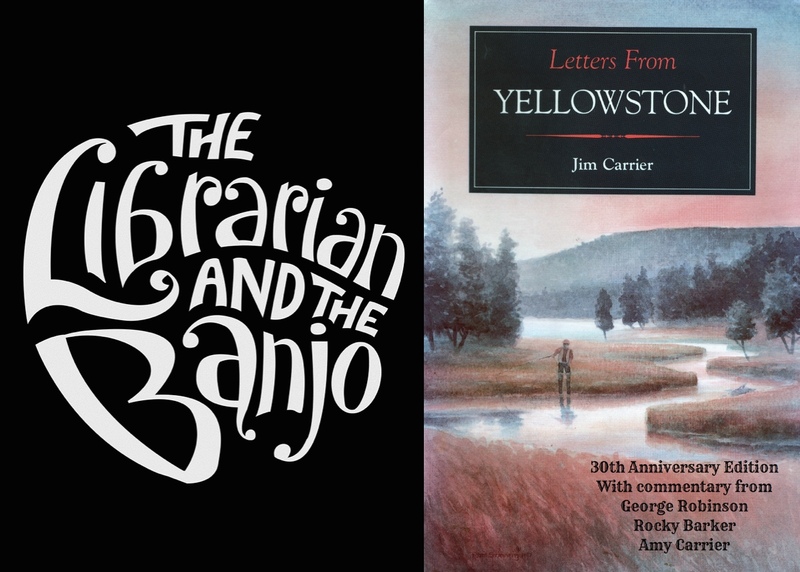 Jim Carrier, a veteran writer, contributor to the New York Times and the National Geographic, transatlantic sailor, and a GPS entrepreneur, provides the first easy-to-understand primer on the fascinating history and vital importance of this civilizing tool. With 25 photos and illustrations. Available as a 54-page paperback for $5.99 from Amazon. Also available as an eBook at Amazon, Barnes & Noble, iBook, Kobo and Google books. This entry was posted in Uncategorized on November 27, 2016 by jimcarrier. 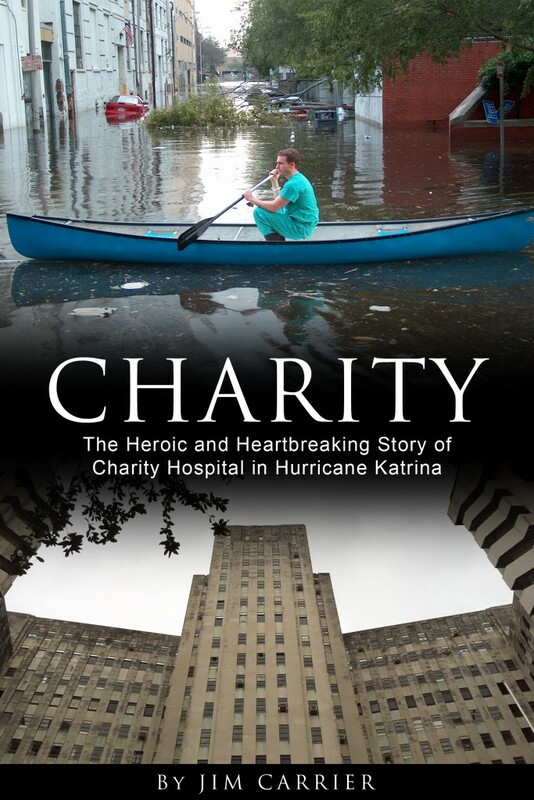 CHARITY – The Heroic and Heartbreaking story of Charity Hospital in Hurricane Katrina, is now available in paperback. The Amazon price is $10.00, and is available here. The book has been updated, and newly annotated. It is also available as an eBook for $2.99 at Amazon, Barnes & Noble, iBook, Google Books and Kobo. This entry was posted in Uncategorized on January 29, 2016 by jimcarrier. 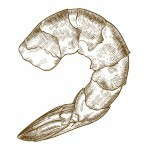 Shrimp: so cheap and yet so costly — read the story behind the riddle. Holiday parties, football games, celebrations of any kind sparkle with a big platter of shrimp. Served on ice with a splash of cocktail sauce and spritz of lemon, there is nothing that exudes luxury and generosity like shrimp. Guaranteed — they will be gone in minutes! Shrimp — The fruit of the sea. In this expose and history of the shrimp fishing industry, science reporter Jim Carrier details how shrimp devolved from rare, pricey, hand-caught seafood to an industrial commodity raised in salt water feedlots. Carved from environmentally sensitive wetlands, filled with antibiotics, pesticides and animal waste, shrimp ponds in poor tropical countries now supply the first world with 90 percent of its shrimp. Fed with ground seafood and grain, these shrimp are packed into shiny cartons by poorly paid, often slave, laborers under conditions that would turn your stomach. Protests from indigenous fishermen have led to their murders. Researched for a year along the Gulf and California coasts, underwritten by a grant from the Fund for Investigative Journalism, All You Can Eat is the first attempt to peel back the facade of picturesque shrimp boats seining delicacies from the ocean. 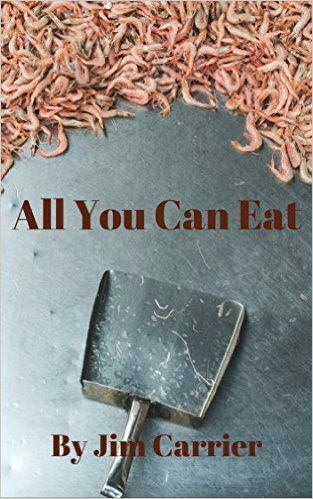 First published in Orion magazine, and included in Best American Science and Nature Writing 2010, All You Can Eat is updated and revised with Web links and pointers on shopping for shrimp. The 5,000-word eBook is available, for $2.99, at Amazon, Barnes & Noble, iBooks, Google Books and Kobo. Here is a recent investigative report from the Associated Press on the shrimp-packing slave trade. This entry was posted in Uncategorized on December 31, 2015 by jimcarrier. Aug. 29, 2015 marked the 10th anniversary of Hurricane Katrina. Lost in the long aftermath of the storm’s deadly destruction, scandals and even, at one hospital, euthanasia, stands the heroic story of Charity Hospital, the country’s oldest hospital. CHARITY is my latest book – a gripping, 25,000-word read, available as an instant download from all major sellers – Amazon, Barnes &Noble, iBooks, Google Play, and Kobo. It is also available as a paperback, $10 from Amazon. With a new afterward: Where are they now? Updating the life stories of the storm’s heroes: doctors, nurses, staff – and patients. With a sketch of Charity’s replacement hospital open Aug. 1. 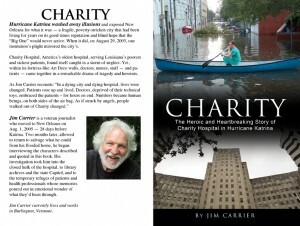 Pieces of the Charity Hospital story were reported during Katrina and its immediate aftermath. What has never been told is the remarkable five-day transformation of an infirm institution, caught in a sea of death and indifference, into an island of care and tenderness. Cut off from medical gizmos, cast loose by government, Charity’s manifest found themselves in a boat together. They did not sink into chaos. They found humankind, affection and love. Only that can explain why Charity, with the sickest of the sick, lost the fewest lives – 8 out of 154 reported deaths at flooded health care institutions. Katrina, as storms do, washed away illusions and exposed weaknesses: the levees, the morally gutted police, a rickety infrastructure, a fragile society that had been living for generations on the take and on the come, and a city – and a state and a nation — that could not, or would not, care for its own. Charity’s frailties were laid bare, too; it was a sick, white elephant. In the wake of Katrina, with the hospital a dark hot tomb, its staff laid off and dispersing, an official ambivalence about rebuilding Charity eerily echoed the larger debate about rebuilding New Orleans – and provided health care for the indigent. In retrospect, the sense of doom is excruciating. Having lived through it by evacuating my Lakeview home, having watched (from afar) the storm roar past, and the slow tsunami that drowned my dreams, emptied New Orleans and left Charity art deco carrion, drama is an inadequate word. The hour-by-hour recreation of this hospital’s final days is one of the most grievous and heroic stories in American history. What survived, and soars, is this: In a dying city and dying hospital, lives were changed. Patients rose up and lived. Doctors, deprived of their technical toys, embraced the patients – for hours on end. Numbers became human beings, on both sides of the air bag. As if struck by angels, people walked out of Charity changed. This entry was posted in Uncategorized on July 13, 2015 by jimcarrier. The acclaimed documentary on music librarian Dena Epstein and the black origins of the banjo is now available for instant viewing on Amazon. You can rent or buy the film at this link. This entry was posted in Uncategorized on March 2, 2015 by jimcarrier. This year’s 50th anniversary of the “Bloody Sunday” in Selma, and the Voting Rights Act of 1965 has prompted a new wave of visitors to civil rights sites. 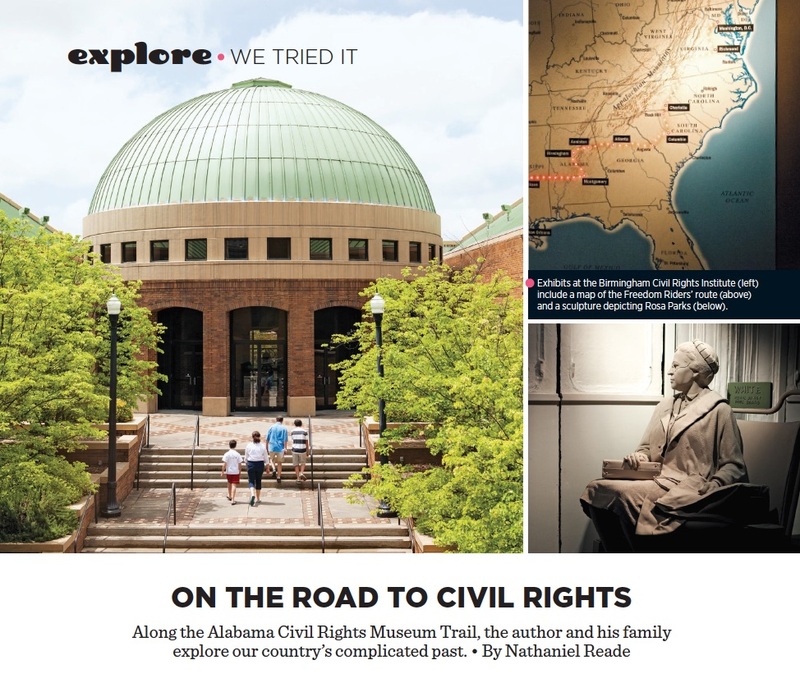 Meredith, the publisher of Parenting and Family Fun, published an article about a family that visited the historic sites with their children, guided by my book, A Traveler’s Guide to the Civil Rights Movement. This entry was posted in Uncategorized on January 24, 2015 by jimcarrier. Carrier’s Marlboro quest, carried out before Google search and with Philip Morris going out of its way not help, wound its way to the most iconic Marlboro Man of them all – Darrell Winfield (pictured). The Wyoming rancher, who did his first campaign for Leo Burnett and Marlboro in 1968, passed away this week at age 85. As we re-entered the [Native American] sweat lodge, I realized my search was over. I’d looked on the billboards, in the hat shops, in rodeo shutes and wide open ranges, in museums, books and minds of the West for this Western man. But I’d learned that who he was came not from his hat, his set on a saddle or – least of all – the brand he smoked. The cowboy beside me was just one I’d found, and it had nothing to do with his looks. What I’d been seeking was the soul of the West, embodied in its people. As the water was sprinkled and steam rose again, I knew I’d found the Malboro Man. Thus culminated a daily newspaper series that reads today as authentically journalism old-school as Winfield was, evidently, authentically Old West. RIP. Here is the Ad Week blog link.